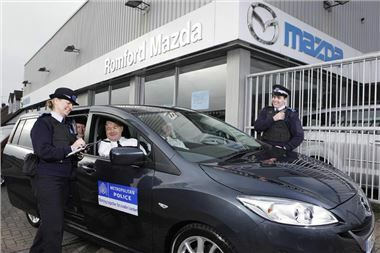 Mazda UK has this week continued its support and commitment to the Metropolitan Police Service in Havering and has recently delivered a new Mazda5 to the St Andrews Safer Neighbourhood Team. Safer Neighbourhood teams operate on every ward within London and serves the community at a local level dealing with issues as diverse as schools presentations and neighbour disputes to raids on drugs venues and licensed premises. A Safer Neighbourhood Sgt, two Police Officers and three PCSO’s will patrol all areas of the St Andrews ward including green spaces on foot, on bicycles and now in a vehicle. Thanks to the generosity of Mazda UK the team will be able to continue to patrol effectively and promptly to all areas of the ward. They will be able to transport crime prevention materials to venues across Hornchurch as well as increasing the area that can be patrolled by a single officer. St Andrews Safer Neighbourhood Team has worked with Mazda UK for four years in the provision of a series of vehicles for the team to utilise. The team have found that these are invaluable in keeping down crimes of all types. St Andrews Safer Neighbourhood Sgt Paul Murray said “The Mazda5 is a fantastic vehicle for use on the borough. Having seven seats I can transport my team to drop off points throughout the ward within a matter of minutes rather than relying on public transport. We can attend appointments promptly and make home visits to those who require them to discuss policing matters without incurring long travelling times and delays.